Laminin – A Message From God? 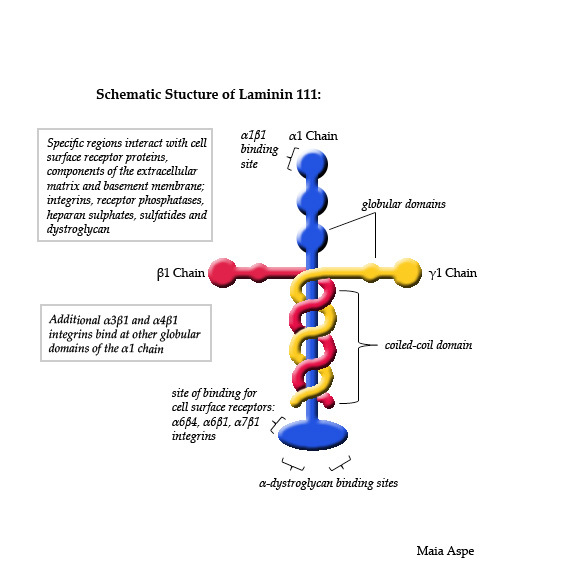 Laminin. Some people think it shows the way to God, others think it looks like a wilted flower. 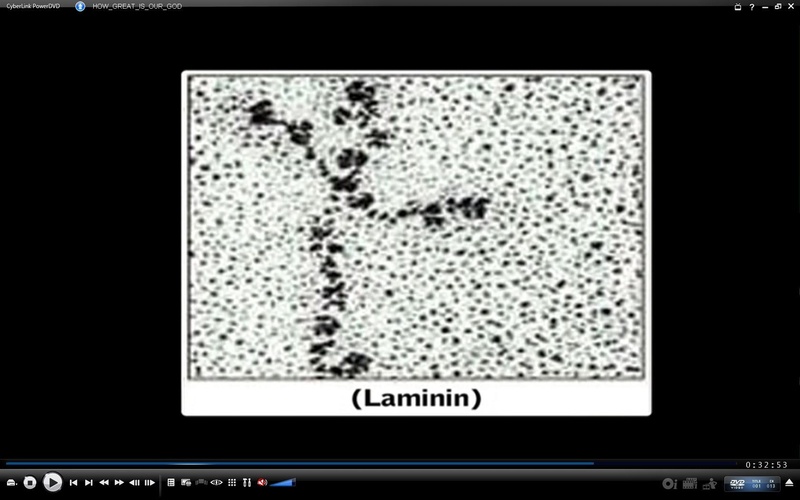 Laminin can only be seen through an electron microscope. It’s part of the basal lamina which is part of the cell lining. 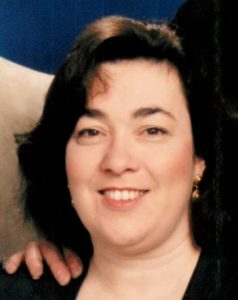 The next picture, from cc.edu. might give you a better understanding. What good does it do? 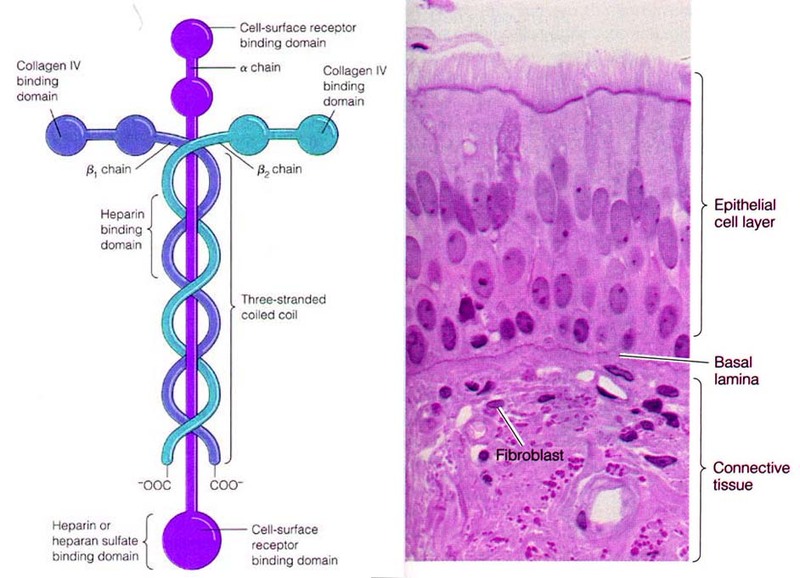 Laminin binds to other cell membrane and extracellular matrix molecules. The three short arms bind to other laminin molecules to form sheets. The long arm binds to cells, anchoring tissue cells to membrance. Without laminin our tissues would not survive. Dysfunctional laminin is linked to congenital muscular dystrophy. This last picture is of actual laminin molecules. Snopes thinks the cross shape is merely a coincidence. After all, lots of things in nature are cross shaped. Personally, I believe in a Creator, a Master Designer and I believe He has left clues throughout nature to point us to Him. So you decide for yourself. Is laminin a wilted flower, a simple coincidence, or a Master stamp. Have you ever seen the Helix Nebula before? This is a composite of pictures from Nasa’s Hubble telescope and Kitt Peak National Observatory. Yes, it is real, but the color was added by Nasa. I suspect for more impact, for a cover layout they were doing. Nasa, also, never gave it the name Eye of God. I wonder if the first man to visually see it had to be picked up off the floor. I know I would have passed out. A nebula is a dying star. 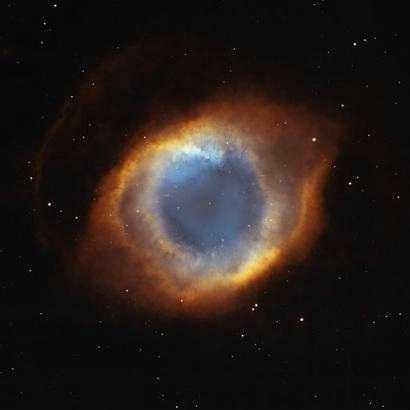 The Helix nebula is 650 light years away in the constellation of Aquarius. It’s a trillion mile long tunnel of glowing gases. If our sun died it would look pretty much like this. Stars like our sun and Helix burn by turning hydrogen into helium by nuclear fusion. 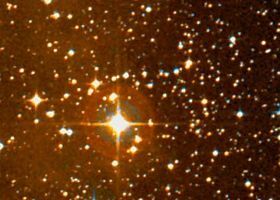 When the hydrogen is exhausted, the star starts burning the remaining helium at a greater temperature. When the helium is used up the star dies sending off gas layers around the hot core. The core is called a white dwarf and so dense that a teaspoon of white dwarf would weight more than a couple elephants. 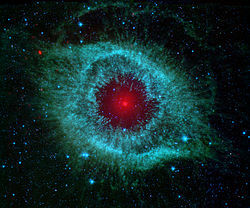 The following is also a picture of the Helix nebula. You will notice a small dot in the center. This is the white dwarf. I’m not sure, but I think this one also has color added. It helps to see it better. I can’t help but be amazed that God would put this in the heavens just so we would be reminded that He is watching over us.